Chris Craft is a luxury boat company that specialized in making fine wooden boats for all types of recreational use. After struggling through various hardships in the 1930s, Chris Craft shifted its focus to aid the war effort during World War II. They competed against other boat companies, such as Higgins and Gar Wood, for government military contracts. Eventually, Chris Craft began fulfilling contracts for marine engines U22 utility boats, picket boats, landing craft, command boats, target boats, and quartermaster ships. Now Chris Craft is one of the few recreational boat manufacturers that can claim their products have been tested under live fire. It all began in 1874 when Christopher Columbus Smith built his first wooden boat by hand at the age of 13. It was intended to simply be his personal recreational boat to be used for duck hunting, racing, and enjoying the spray of the open waters in Algonac, Michigan. However, his natural talent for woodworking led to his reputation as a master boat builder. Word began to spread throughout the Detroit area and Chris Smith found himself a niche in the market for recreational boat building. To meet the ever growing demand, Chris Smith teamed up with his brother Hank and thus created the foundations for the future Chris-Craft company. The boats that the brothers specialized in making were runabouts which aimed to be fast and elegant yet sold at an economic price. In the year 1910 the two brothers joined up with other partners to create the Smith Ryan Boat Company which continued to focus on economically priced runabout boats. In 1922 the company name was changed to Chris Smith & Sons Boat Company. At this point, Chris Smith had many different types of hull designs for different purposes including pleasure cruising and speed boating. These mahogany dreams were so popular that dignitaries such as William Randolph Hearst and Henry Ford had their own Chris-Craft. Chris Smith’s son, Jay Smith, took over the family business in 1927 and soon after, Chris Smith passed away in 1939. 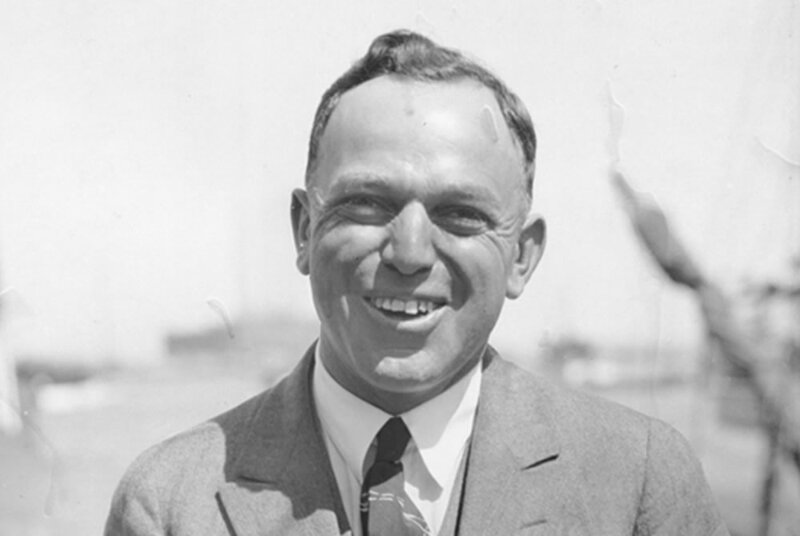 Jay Smith led the company through the hardships of the Great Depression, but due to a continued legacy of good leadership and excellence in boat building the company survived. During the pre-war period, Chris-Craft reverted back to its originally boat designs for runabouts and began selling them cheaply to stay afloat. During WWII, Chris-Craft began bidding for government contracts to aid in the war effort. 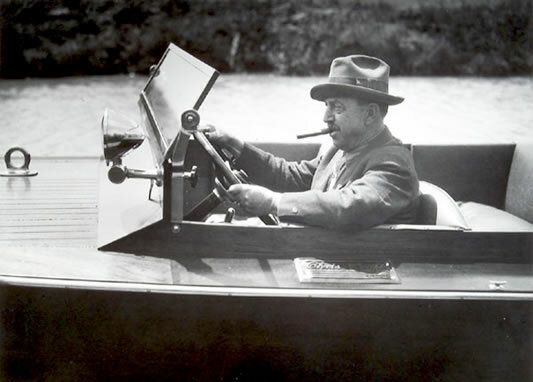 After WWI, Chris-Craft began expanding its inventory to include more models as well as fiberglass boats. They were eventually bought up by an investment group and are no longer the humble family business operating out of Algonac, Michigan. Chris-Craft continues to produce boats and yachts commercially to this day. What really sets Chris-Craft apart from any other recreational boat company (besides its classically elegant mahogany runabouts) is their participation during WWII and the vital support role that they played to aid the war effort. In order to make it through the tough economic times, Jay Smith did two things; he began producing more reasonably priced runabout style boats and he would begin bidding for government contracts. Christ-Craft’s first involvement with working for the U.S. military began with competing against Higgins boat company to build landing craft. Ultimately, Chris-Craft lost and Higgins went on to create the Landing Craft, Vehicle Personnel (LCVP) that were deemed crucial to the success of D-Day by Eisenhower himself. In February of 1941, Chris-Craft won a contract to supply marine engines that other corporations would use in their vessels. Chris Smith was a speed enthusiast and was very experienced in choosing the right motor for to fulfill the requirements. Their next deal was an order of 27 U22 Utility boats that were used by the Army Air Corps to rescue airmen whose crashed into the open waters. In May of 1941, three modified 60 foot cruisers filled the obligations of their next small contract. Up until this point Chris Craft appeared to be a small factor in the war effort and they were plagued with issues with the labor union. A labor strike forced the company management to obtain a restraining order that directed the union membership to cease its actions that inhibited orderly business conduct. It was around this time that Chris-Craft started to expand to other areas in Michigan. Holland, Michigan was a prime location for a new production plant to help fill the increasing demand for boats, both in the military sector and the private sector after the conclusion of WWII. Holland had a rich history of boat building resulting in a skilled labor force whose talents were going to waste as many companies struggled through the Great Depression and WWII. Another beneficial factor for choosing to open a new plant in Holland was it lack of labor unions which had pestered the company earlier. It wasn’t until after the bombing of Pearly Harbor, when the U.S. declared war against Japan, that Chris-Craft had a larger impact on the war effort. With the growing demand for amphibious landing vessels needed in both theaters of war, Christ-Craft secured several bids to build LCVP style boats. The ability to apply mass production techniques to boat building and yet still retain a great level of attention to detail was a significant reason for Chris-Craft’s success throughout the war years. Chris-Craft was able to quickly change their production lines to fit the new specifications of military boats due to its expertise in production line management. The very recognizable LCVP was typically constructed out of marine-grade plywood that was painted to keep an air tight seal. In fact, Chris-Craft did not start building with any other material other than wood until the early fifties when it started using fiberglass. Later, after buying out the rival, Holland based Roamer Boat Company, Chris-Craft started using sheet metal in their designs. Now Chris-Craft was charged with building a plethora of boat types for the war effort. One of these boats, the picket boat, was originally used by the U.S. Coast Guard to combat the illegal sale of liquor during the prohibition. After the end of the prohibition in 1933, the Coast Guard still worked with the picket boats because of their ease of operation, low cost, and versatility. Chris-Craft began building picket boats for the U.S. Navy to use for patrols and rescuing personnel from downed aircraft and sinking ships. Picket boats also took over the role of monitoring anti-submarine netting to protect against enemy U-boat movements and frogmen operations. Picket boats were only used for harbor or close-to-shore operations, but were sometimes carried by larger transport ships over the high seas. Chris-Craft not only supplied boats necessary to the U.S. Coast Guard, Navy, and Army, but they also used their well-earned reputation and recognition to foster sympathy and funding for the war effort. Throughout the war, Chris-Craft would release posters showing sleek and futuristic designs of luxury recreational boats with the saying “Buy war bonds today, Tomorrow command your own Chris-Craft”. Designers and architects at Chris Craft were able to dream up beautiful and elegant concepts during the war years. Mainly because their main focus was dealing with the harsh lines and utilitarianism of military craft. These posters would be featured nationally in publications such as Time Magazine and raised awareness for the American War Bond Drive. Chris-Crafts involvement during World War II is quite amazing and yet, it seems to be relatively unknown. In any war, there are those who fight and those who support them in their fight and both are necessary for victory to be achieved. Chris-Craft embodied the American military-industrial complex of the 1940s that allowed the Allies to defeat the Axis powers. 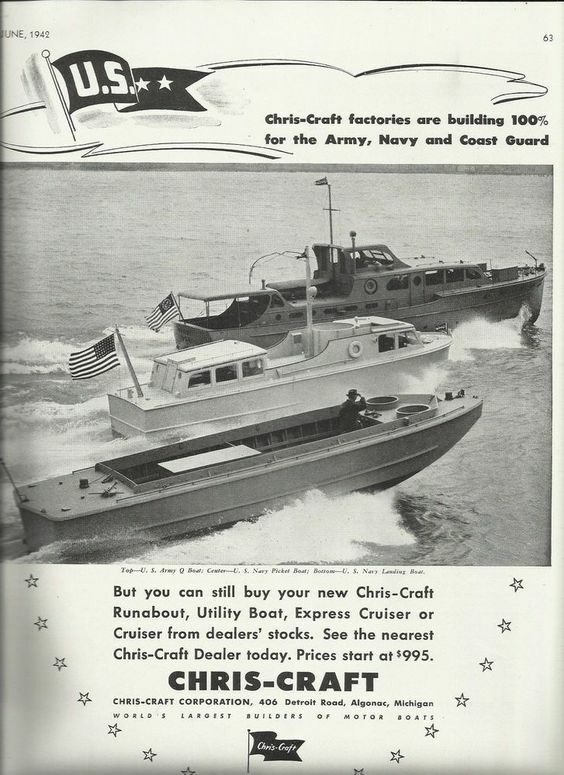 Throughout WWII, Chris-Craft was able to successfully ramp up production to meet the demands created by the military’s need for more and more vessels. Looking at the companies involvement and efforts made during this time makes it hard to believe in their humble beginnings. They started off when a young boy decided he wanted to have a duck hunting boat. His extraordinary skill with boat building led to the creation of one of the most iconic boats of the 20th century and to vital support to the war effort. “Our Story: An Icon is Born.” Chris-Craft. “1942 WW II Christ-Craft War Boats Ad – Q Boat – Picket Boat – Landing Boat.” Pinterest. Mollica Jr., Anthony. Savage, Jack. (2001). “Chris-Craft Boats”. MBI Publishing. St. Paul, MN. Joachim, George J. (1994). “Iron Fleet: The Great Lake in World War II”. Wayne State University Press. Detroit. Wright, Wilson. “Mahogany Memories: Chris-Craft Antique Boats”. Turner Publishing Company. Nashville, TN.